Are you struggling to stay consistent in your network marketing business? Maybe you know what to do but never seem to get to it. Tomorrow becomes next week, next week becomes next month and so on! Or maybe you succeed in taking action for a period of time but then stop because you aren’t yet in profit. Staying consistent is the key to growing a profitable, successful MLM business. Even if you are not yet seeing a profit, consistency is your best friend when it comes to succeeding at anything. 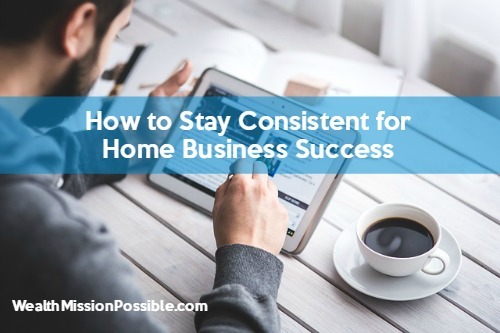 Today I have some reasons and tips for you on how to stay consistent for home business success. I believe that understanding why you need to stay consistent is the key to actually doing it. 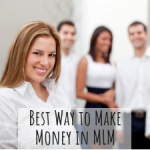 You’ve probably read all the tips about network marketing and attended lots of training. All the “How-to’s” in the world won’t help you if you are not staying consistent in network marketing. Sometimes your motivation may go away due to lack of income. But I promise you, if you do the income producing activities anyway, you will eventually make money. It is your consistent action that will cause that to happen or not. It’s really that simple. Decide what you want. I’ve heard all the excuses. “I’m too busy” “I was too tired” and so on. How big is your WHY? What is your reason for starting your business in the first place? Is your why important enough that you made it a priority in your life OR is it just another wishful thought? When something is important, you make it a priority. If it’s not, well then, you know the rest. When I started my business I worked full time and was involved in a few volunteer activities. I still made sure that I took action on my business daily no matter what! My cubicle job made me so unhappy and freedom was calling! That freedom was and still is my priority. Not attracting anyone to your business? Maybe it’s because you are inconsistent. Success leaves clues. You may have heard that quote. If you are not consistent, you won’t leave any success clues. If your audience sees you today and not tomorrow, or if you constantly change gears, people will not see you as a leader or even a person they want to partner with. Sticking to a daily routine is a great way to staying consistent for home business success. All successful people have a daily routine that they stick to! Instead of living your lifestyle, live your life by incorporating the habits of successful people. Take a look at some top earners. Don’t look at what they have, look at their daily habits and create your own routine. Staying consistent takes determination and discipline. We do it whether we want to or not. Think about whether your business is important enough in your life to live the lifestyle you always wanted, or just a little wishful thinking. PS If you are struggling to MAKE MONEY in your business, this is the training you should get – 5-Step Profit Blueprint. If you got some value from this How to Stay Consistent for Home Business Success, please feel free to share! This is one of the most important lessons I teach my team members. Without being consistent, nothing else really matters. Anyone can be excited for one to three months, but real success comes when you do things day in and day out. You need a daily mode of operations and then you need the discipline to do it every day no matter what. That really is the key to success.